When the Mitsubishi Engelberg Tourer concept first made its debut at the 2019 Geneva Motor Show, one could call it nothing new. Another plug-in hybrid from Mitsubishi Motors? It took several years for the Outlander PHEV to even make it to America, why should we get excited about it? Here we are a month later, and having more time to review it, the Engelberg Tourer may be more than just another plug-in hybrid SUV. It’s sporty, living in Mitsubishi Motors shadow of sports cars, and there are subtle hints of luxury all throughout the vehicle. If anything, this next-generation plug-in is hitting all the notes Mitsubishi is known for and even pushes further into ecosystem territory. 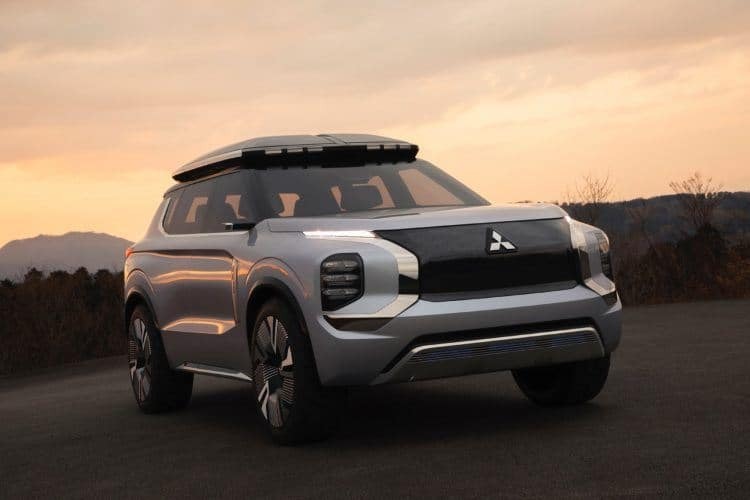 Mitsubishi Motors has thrown around the term “high-performance electric SUV” more than once, starting with the resurrection of the EVO nameplate on the Mitsubishi e-Evolution concept. Aside from the difference in powertrain, two high-torque electric motors on the EVO versus a 2.4-liter gasoline engine and two electric motors on the Engelberg Tourer, both models are built for performance with Mitsubishi Motors signature all-wheel control technology. Seen commonly as an option under the acronym (AWC) or (S-AWC) for “Super” All-Wheel Control, the Engelberg Tourer comes with a twin-motor full-time 4WD system, powered by S-AWC and Active Yaw Control (AYC) in the powertrain. In simple terms, the Engelberg Tourer has the handling dynamics of a rally car while still being a rugged off-road SUV thanks to electric motors, known to generate a lot of torque. In mechanical terms, the AYC allows the electric motor to tailor the torque split between the front wheels and works with S-AWC to monitor the output in each motor (one in the front and one in the rear) for that four-wheel drive action. Add in active stability control (ABS) and other systems that keep the SUV grounded, and it’s starting to sound more like this is an SUV that can handle tight turns on the raceway. Because the Engelberg Tourer concept is a plug-in, consumers will be able to drive on gasoline, electricity, or both as they choose. If going with all electric, consumers can expect a cruising range of 43 miles. If using both power sources in tandem, the Engelberg Tourer can drive up to 434 miles before needing to stop for gas and recharge. Speaking of recharging, consumers can, of course, go the usual routes: recharge with a home appliance outlet over nine hours or more, recharge with a 240-volt installation to recharge in five hours, or charge up at public charging stations. The Dendo Drive House (DDH) offers consumers another option. With plans to be made available for installation in late 2019, Mitsubishi will also be offering consumers a chance to turn their entire house into a large battery unit that can not only power all of their appliances but also their plug-in hybrid electric vehicle (PHEV). It’s an eco-friendly solution that can save money on electricity with solar panels and PHEV technology. Some are calling it “neutral” or “clean” energy. The reception for the Mitsubishi Engelberg Tourer is the true test for the process. We’ll be waiting for Mitsubishi to bring their new plug-in hybrid to a North American automotive show before getting too excited. Still, that Dendo Drive House sounds like a cool idea, and we doubt there’s an obligating contract that one needs to own a Mitsubishi vehicle to get the house. The Engelberg Tourer is simply designed to be the vehicle in mind, with Mitsubishi possibly offering installation package deals through automotive dealerships. What did you think of the Engelberg Tourer? Enough to be more than just a concept? Let us know on University Mitsubishi social media.